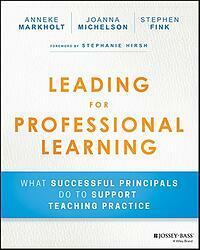 As a principal, what role do you currently play during teachers' professional development? This tool provides the steps, outline and rationale, and questions to ask yourself as you sponsor professional learning. The tool below, "Sponsoring professional learning: A principal's role," is included in Chapter 5 of the book, Leading for Professional Learning: What Successful Principals Do To Support Teaching Practice, by Anneke Markholt, Joanna Michelson and Stephen Fink. © 2018 Jossey-Bass. A principal’s role during a professional development session is just as important as their role in setting the larger context and/or planning for the session. No matter who is leading the professional development, an outside consultant, a district leader or coach or a school coach or teacher, the principal’s sponsorship during the session is crucial for implementation. Opening the session A principal’s message at the beginning of a session sets the tone for teacher learning, makes the purpose clear and ties the learning to the big picture and the practicalities of daily teaching. If a principal is not clear about what they want to say or the tone they want to communicate, they can unwittingly derail the opportunity for teacher learning. What is the purpose of the professional development? How does the purpose tie to a need? What exactly will teachers learn today and why is that important? How will what they learn help their students immediately or in the long term? What is the teacher’s role today? Participation during the session A principal’s participation during the session can signal the importance of teacher learning. If no one is present or supporting the learning or making it clear, teachers will see the session as just another thing to do or another unclear and disconnected initiative or session. It’s important to value teacher learning as an instructional leader. It’s not enough to just “sit in." The principal’s role during the session is planned intentionally. What do I want to observe for in the facilitator’s work and what do I want to observe in the teacher’s learning? Why? When will I interject and guide teacher learning? When will I let the teacher learning take its course? When will I actively participate in the learning? How will I help teachers connect their learning to the expectations for implementation? How will I signal this during the session? Closing the session Closing the session is an important way to bridge teacher learning to implementation. During the closing is an opportunity to share evidence of teacher learning during the session. It’s also a time to reiterate expectations of implementation and the support teachers will receive to be successful at implementation. What evidence of teacher learning is important to highlight? How did the evidence of teacher learning meet the outcomes of the session? What did I see during the session that showed me that the teachers will be successful during implementation? What did I see during the session that showed me that teachers will need more support? What kind of support? What is the plan for supporting teachers?